Las Vegas is the land of losers, but not for most who attended the Topps 65th Anniversary Party on January 18th. Topps handed out gifts to the privileged crowd, that in most cases, exceeded the steep price to attend. Over 66 Kris Bryant cards were a part of the swag given to every person. His cards just happen to be the hottest thing in the modern baseball card market since Mike Trout and Bryce Harper asserted themselves several years ago. Personally, I was able to sell 60 of the 65 cards from the 65th Anniversary Kris Bryant Set each attendee got for more then the $2,500 I paid for the pass. The party could end up being a small financial come up for me, but I felt the event was light on entertainment. I was disappointed there wasn’t even a real nod to their illustrious past making baseball cards. Collectors who couldn’t attend might question why cards that were meant for unopened packs & boxes be a part of the giveaways for the evening. 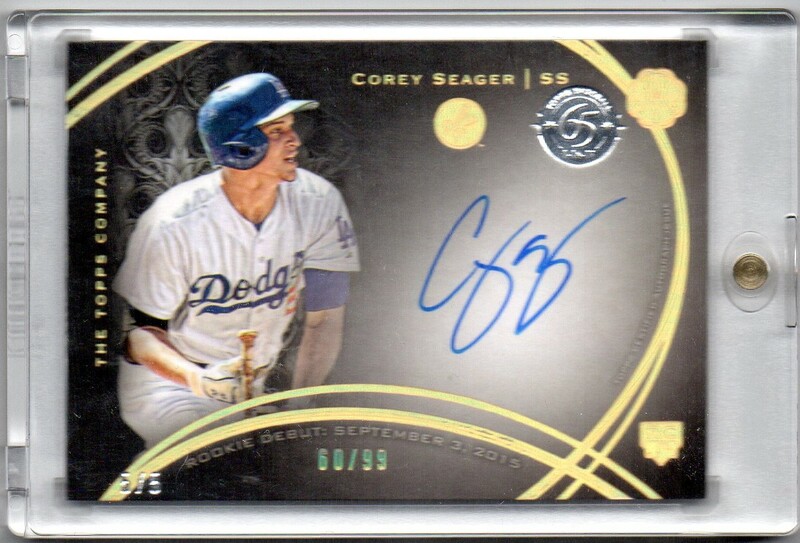 For example, I got this Corey Seager 2016 Topps Mint card that was serial numbered 5/5 to the party. I guess those 5 Seager cards from the party never made it into the packs themselves? A few of the employees at Topps were less then thrilled with my live stream coverage of the event on Twitter. One asked me to not record at a certain moment, and another told me to stop altogether about midway through the event. Some dealers have asked me not to film them at the National, so it’s not something I get hot and bothered over. Topps could think about embracing the live stream coverage more. If I didn’t live stream the event, I would have just half drunk tweeted over 100 times off the dome. That might have proven to be a far worse option for them compared to a live stream of their own employee talking. Personally, I would have much rather tweeted stuff off my head and not have to hold a camera for 5 minutes at a time. I often get accused of being biased and negative. The great thing about a live stream is that it removes my filter and the viewer can see for themselves what the party is like. I would have found everything under the sun to make fun of during the event because that is my nature. The live stream removed that altogether and people were able to form their own opinion. The story checks out for Kris Bryant. He has the “aw shucks” humble demeanor, but with male model good looks. He admitted privately to being a little tired. He’d just spent the last week traveling to the White House, getting married, the Topps party, and was off to New York the following day. The smartest person in the room proved to be Tom Fish of Blowout Cards. He purchased over a dozen passes and walked away with hundreds of Kris Bryant cards to sell or keep. There will be more Topps parties such as this held in the future, but it’s unlikely anyone will get the value Fish was able to secure.